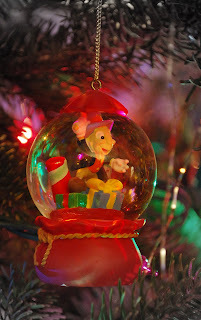 Not much time for a post today but I've been such a bad blogger for this whole month so far that I wanted to take the time to at least post a couple more pictures of ornaments. Not as another tease, mind you, but because I wanted to try something out! I was doing some reading Wednesday night about techniques for taking better holiday pictures and decided to break out the tripod and try taking a few pictures after I got home from work last night to see if I had retained anything of what I'd read. Not exactly having a mind like a steel trap these days, I forget a lot more quickly than I remember but I guess that's just one more of the joys of growing old! 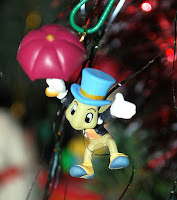 A lot of my Christmas ornaments have come as presents from my cousin Amy and she's given me quite the assortment of Eeyores as well as a couple of ornaments containing this guy - Jiminy Cricket. I used to call Amy my "conscience" back when we were younger so it became a running tradition for her to give me things with Jiminy on them. I've got this bigger ornament to the left as well as this other little guy holding one of the world's tiniest umbrellas - this one also just happens to be the smallest ornament on my tree. Truth be told the ornament was probably designed for one of those little miniature trees that they used to make but I figure that crickets - by nature - are generally pretty small so he's probably pretty close to scale and even though most people probably aren't going to notice him on the tree, I know he's there! Now, as for the tree itself ... I'm still trying to figure out the whole lighting thing and failing miserably but I didn't want to keep you in the dark too much longer ... though this picture below is pretty dark! 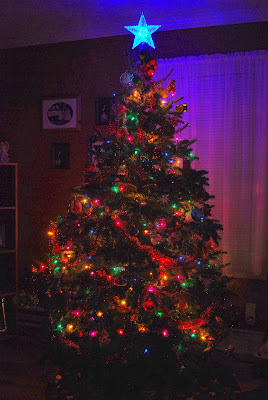 I reallly have lousy lighting in my living room and even though I used a tripod, set the camera to a longer exposure time, and even used the self-timer to cut down on camera shake you can barely make out the tree. Ah well, at least it sort of gives you a general idea of at least the size of the tree and the lighting. I promise to keep trying until I get it right as it's good practice with the camera and also gives me a goal. Of course, all of that is going to have to wait until after tonight's Dispatch Party but I'll work on it - honest! Beautiful tree and ornaments. Crickets are little so I approve! 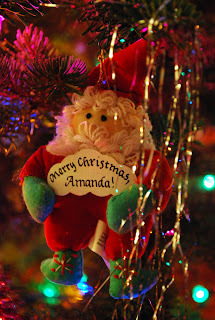 We still don't have any Christmas decorations up since Hubby is still sick. It's pretty depressing. I'll come by and look at your tree to cheer up. Your photos are coming along wonderfully, and I like the last photo. It's very pretty. I used to lie on the couch when I was at home, with the lights on the tree and just dream. This photo reminds me of those times. I love the dream-like quality of the photo of the full tree. I like the fact it's dark. I could lie down on your couch and just stare at it, kinda like what Gracie said. Would you and Amanda mind? Wow, your tree is awesome Linda. I love it. 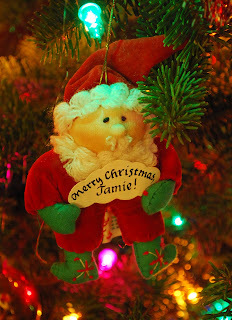 I love all the different ornaments too. Very well done. Beautiful. I have a hard time photographing christmas trees too. I want them lit, but I also want to be able to see the ornaments. Its a tough challenge. Hugs for you and Jamie! Ah, the entire puzzle is finally put together. LOL! 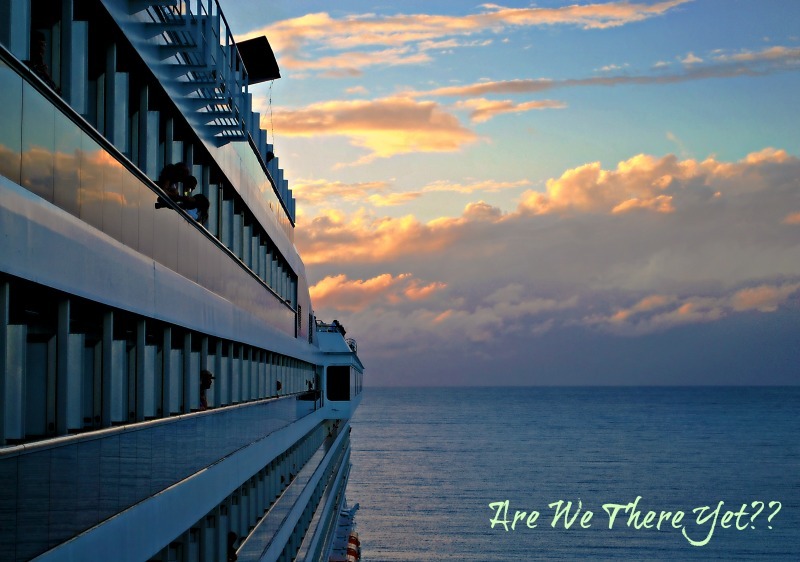 Beautiful photos--very well done!--and a beautiful tree, Linda. It's just a bit underexposed, which is easily fixable. Bracket, bracket, bracket! LOL! Holiday lights are very challenging. I love the camera ornament, by the way! So cool! Great ornaments and tree. As ever, your photo technique comes through! Fantisimo! I've enjoyed *watching you* getting the tree together! prettiest one i have seen this year! congratulations!! !